Why is this one an honorable mention, especially considering that it began in 1981 and is still being continued today? Well, the primary reason is that it is more a gazetteer than a series adventure. Lakofka’s vision is more about adventuring in his Lendore Isles than about a seamless story arc that drives an adventuring party onward. 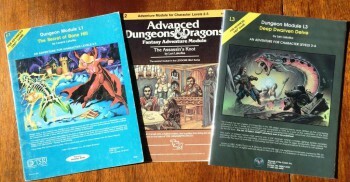 Originally begun in 1981 when Gygax himself solicited adventures from Lakofka, the L series started with L1 The Secret of Bone Hill, and then bled over into L2 The Assassin’s Knot. 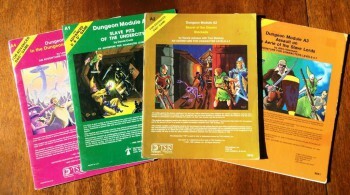 It would be another twenty odd years before the silver anniversary edition of AD&D produced L3 The Deep Dwarven Delve, which at the time was the final AD&D module created by TSR/WotC. That module was taken from Lakofka’s notes delivered to the TSR offices back in the early 80s and fleshed out by WotC staffers. 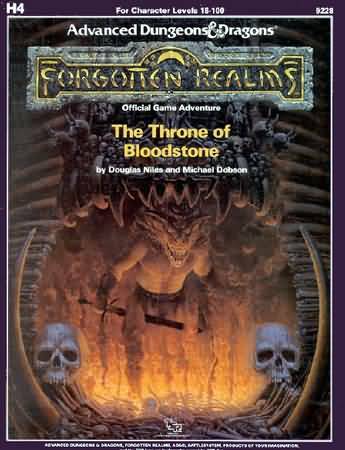 Once Lakofka returned to writing as the OSR community emerged in the mid-2000s, he’s managed to produce L4 Devilspawn through Dragonsfoot, which is available as a free download. Nonetheless, for all its obvious benchmarks, Lendore is a muddle of 1st-5th level adventures without any true coherency. I credit U1 The Sinister Secret of Saltmarsh as the reason I still game today. Having left high school for college, I’d decided to be ‘done’ with role-playing, only to hear dice clattering in the dorm room next to me a month later. Upon investigation, I discovered a group of friends creating characters to run through U1 and finally joined them. The rest is history, and thanks to a very well thought out import from TSR UK, there was little doubt I’d be putting this fantastic little series including U2 Danger at Dunwater and U3 The Final Enemy onto the list. If you’ve never played it, I highly recommend you do. 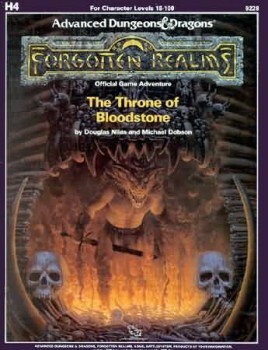 Most people only recognize campaign modules as something that rolled out of TSR in the early to mid-1980s, but FASA managed to get into the game with Tom Dowd’s Harlequin for their Shadowrun system. 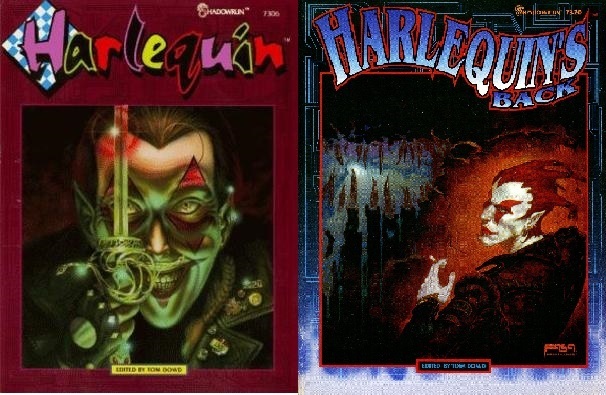 Now granted, Harlequin, and its successor Harlequin’s Back, might not seem like a campaign in that there are only two supplements in the series, but what one must understand is that EACH of these supplements are in themselves supermodules with multi-adventure campaigns. I was thrilled to run Harlequin with my Indiana buddies in the early 90s and it is still something that we talk about today. Truly, these two volumes are an inspiration to those who believe that series adventures can strive to be productive beyond the swords & sorcery gaming genre. Now this is a rather ‘funny’ addition in my opinion, and not because it doesn’t deserve to be called a series module, but because most folks are familiar with the story arc primarily as a result of having read the novel series. If, however, you do want to play out the bulk of the first two books in the Dragonlance series, DL 1 thru DL 8 will no doubt allow you to do so. They are also the first on this list to comprise more than a trilogy, and have multiple writers. In all, they aren’t my favorite series, but they certainly deserve to be included with honor on this list. 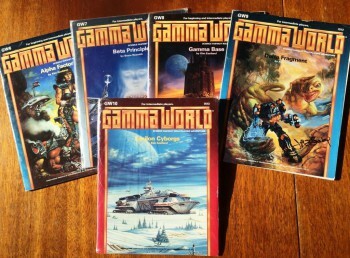 Begun by writer Kim Eastland in 1986, the Gamma World 3rd Edition module series was a huge endeavor, especially for a line that was doomed to be cancelled so soon after its launch. In fact, Eastland was never given the opportunity to finish his post-apocalyptic opus, and it wasn’t until 2003 that an avid fan, Les Braun, completed the series with GW11 Omega Project. Still, Eastland did manage to create GW6 Alpha Factor, GW7 Beta Principle, GW8 Gamma Base, GW9 Delta Fragment, and GW10 Epsilon Cyborgs. Thus, if you are ever in the mood to crack out Gamma World, or just have a great campaign setting for any post-apocalyptic campaign, this super series could be for you. If you are interested in GW11 Omega Project, you can download the free PDF here. While author Tracy Hickman might have not been so well remembered as a module writer for Dragonlance, there is no doubt that he and his wife can be canonized for their work together on The Desert of Desolation. 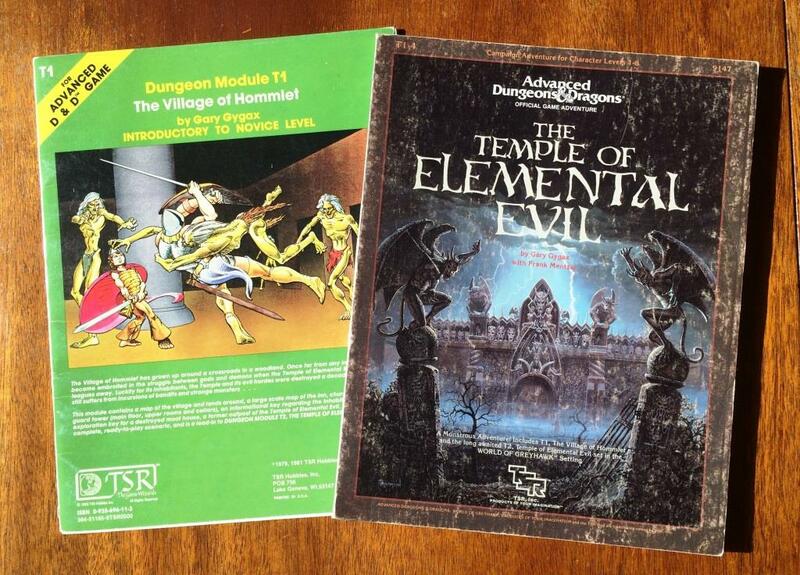 Defining the I series of modules [and that is saying something, considering that line includes the classic Ravenloft] I3 Pharaoh, I4 Oasis of the White Palm, and I5 Lost Tomb of Martek are pure gaming gold. 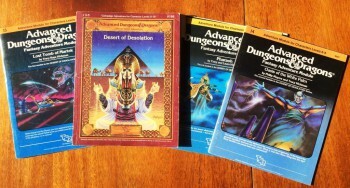 Reprinted as a combined, revised, and annotated compilation in 1987 [by Meyers, Rice, and Wheeler], the series still stands up today as an easily playable desert campaign that will provide countless hours of enjoyment. I find the apparent lack of ‘love’ for Star Frontiers [and the adoration of Traveller] to be disturbing, yet I can’t help but include Volturnus in this lofty list as perhaps the greatest space campaign adventure module series ever made. Beginning with the Alpha Dawn box module SF0 Crash on Volturnus, the series is a fantastic romp for survival by marooned players across the surface of a hostile alien world. It combines so many great elements of science fiction while also managing to stir in the humanity and ‘grind’ of fantasy along the way. Acres & Moldvay spin a nice thread that pervades all of the Star Frontiers universe with the additions of SF1 Volturnus, Planet of Mystery and SF2 Starspawn of Volturnus. Were you wondering when I’d come to Paizo? 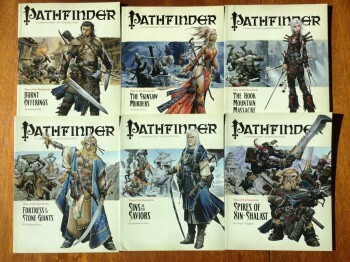 If you were, have no fear, because the six part module series that helped launch the Pathfinder brand cannot be overlooked in gaming lore related to series modules. Born out of desperation by the company, Rise of the Runelords is not only gaming platinum, but it stands the test of time as one of the epic series any player will ever have the chance to play. The brainchild of writer James Jacobs, this quest will eventually take player characters from 1st level to near 17th, a formula that has served Paizo’s multitude of adventure paths since 2007. Jacobs, however, like Hickman before him, shares the workload of so daunting a project with five other authors, each charged with fostering the same arc while bringing their own unique eye to the adventure. The series, marked by P1 Burnt Offerings, P2 The Skinsaw Murders, P3 The Hook Mountain Massacre, P4 Fortress of the Stone Giants, P5 Sins of the Saviors, and finally P6 Spires of Xin-Shalast is like wading into a fantasy novel pool and seeing how it changes around the ripples of your character’s involvement. In fact, I was so taken with the series I interviewed Jacobs about it years ago on Black Gate if you’d like more detail. That interview can be found here. 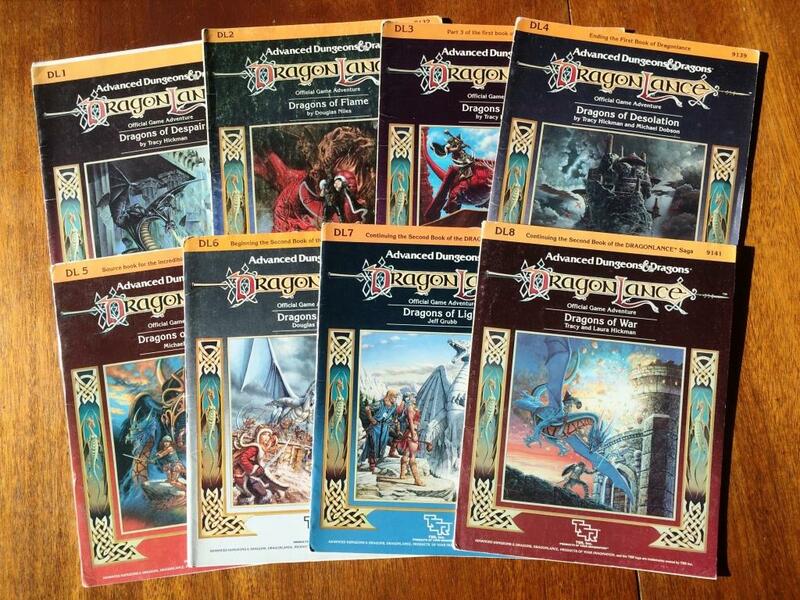 There are very few people who have played D&D prior to the advent of the WotC takeover who aren’t intrinsically familiar with this now venerable series. Initially penned by Gary Gygax, the project was all but abandoned when the company expanded quickly and he was eventually whisked away to L.A. for the celluloid production side of the company. By the time he’d returned, the writing was on the wall, so to speak, and he was ousted from the company before he could fully reinvest himself in the craft that had made the game so great in the first place. Thankfully, T1 The Village of Hommlet would eventually get its series conclusion when writer Frank Mentzer took up Gary’s work and completed T2 Nulb and the Ruins, T3 Dungeons of Elemental Evil, & T4 Nodes of Elemental Evil in the supermodule The Temple of Elemental Evil. I’ve played Hommlet half a dozen times, and Temple twice, so I can attest that it is truly one of the greatest campaigns you can take players on, period. Okay, here is simple advice: if the writing credits include the last names Johnson, Cook, Moldvay, or Schick, it IS going to be great. Slave Lords, to me, is ‘the one that got away.’ I’ve had the series for many years, but I’ve been so adamant that I wanted to play it I’ve refused to run it myself, and therefore have yet to do so in any capacity. However, as it is legendary both in name and artwork, as well as having been done in two supermodule reprints, I have to say it certainly is a classic among classics. As I stated above, G1 was probably the first standardized adventure I ever went on [how unfortunate for my character’s life expectancy! ], and certainly it ranks as one of the earliest modules, let alone campaign modules. Born as a tiny convention module, G1 Steading of the Hill Giant Chief soon joined with its fellows, G2 The Glacial Rift of the Frost Giant Jarl and G3 Hall of the Fire Giant King. Together, G1-2-3 Against the Giants, is a sublime campaign, but luckily for all D&D players, Gygax [and later David C. Sutherland] weren’t done with us just yet. Stringing these modules together with the D series would lead a stalwart band of adventures from the proverbial frying pan into that fire. 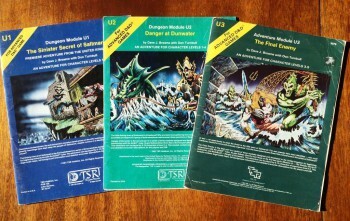 D1 Descent in the Depths of the Earth, D2 Shrine of the Kuo-Toa, and D3 Vault of the Drow, continue an adventure so audacious, so massive, and so ‘new’ that they are as compelling to players today as they were back in the late 1970s. 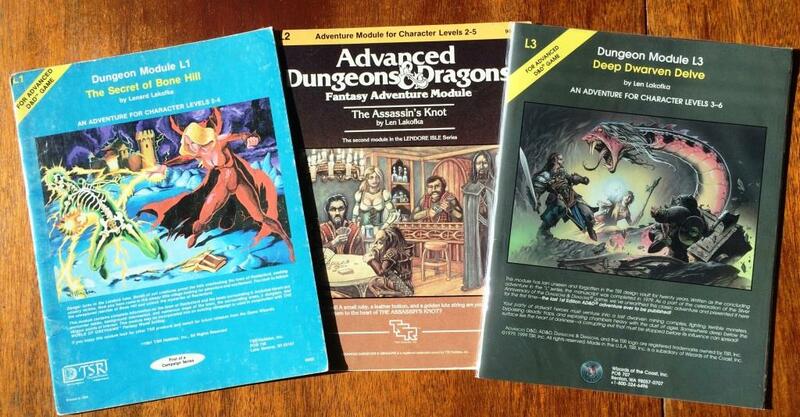 Yet even with six modules in the series, Gygax and Sutherland weren’t done, oh no, not by a long shot! How better to cap such a massive campaign but to encounter the dark goddess of the Drow on her own plane in the Abyss!? Yep, Q1 Queen of the Demonweb Pits is the epic culmination to something I hope players still have fun with today, as I know I do. I’ve played this series half a dozen times in my life, and each time it reinvents itself, becomes fresh and alive, and leaves me feeling like I’ve taken on the hosts of shadow and won a great victory for all the free peoples of the land. It is a true masterpiece, and that is all I really have to say about that. So, 2000 words later, you have my list, and the hope that someday I’ll be able to scratch and claw my way into the annals of gaming lore with my own module series campaign of Roslof Keep, but then, only time will tell. If you like what you read in Art of the Genre, you can listen to me talk about publishing, and my current venture with great artists of the fantasy field, or even come say hello on Facebook here. And my current RPG Art Blog can be found here. Also, take a look at the new AotG, RPG module Kickstarter below! Totally agree with your number one pick. I also have a soft place in my heart for the S series (i.e. Expedition to Barrier Peaks, White Plume Mountain, etc.) as well as Castle Amber (X2 I think). 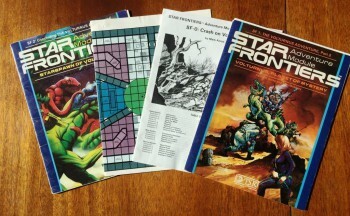 I agree with your comments about Star Frontiers! Me and my friend loved that game, especially the whole Volturnus adventure. Also a fan of the S series, and the C series (although I suppose technically the C series were all standalone, right?). 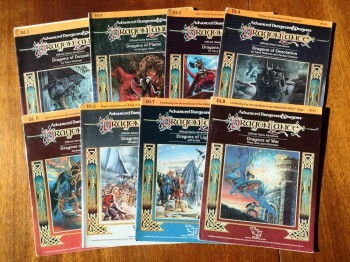 And for non-D&D, one of my favorites is still The Traveller Adventure, which was just a single book, but which contained a lengthy campaign with an interesting main plot and plenty of side content as well. Wow. Our lists would be almost exactly the same. I’m especially glad to see Volturnus getting some love, as I was one of the few who played Star Frontiers yet never ventured into Traveller territory. I find the lack of The Enemy Within (WFRP) most disturbing. Having both played and GMd it, definedly one of the highlights of my RPG experiences. Well, the ending was a bit weak, and less said about Something Rotten in Kislev the better, but Shadows over Bogenhafen and Death on the Reik were just about perfect.